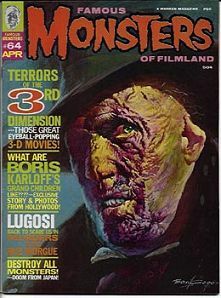 April 1970 issue of FM with cover painting of Vincent Price from "House of Wax" and a feature on 3-D monster movies. Mint condition. Vincent Price (or Vinnie, as his friends called him) was an avid art collector who used much of his income from movies to add to his growing art collection. Despite his screen image, Price was a mild-mannered man with a big heart, who loved to laugh at himself. Website design and hosting by Sohodojo Business Services. Item 158 of 466 items displayed in viewer. 0 items in cart.